Diploma of Ministry – This program requires completion of 10 courses – 30 Academic Credit hours – and represents the initial building block of either Associate of Christian Ministry and/or Bachelor of Christian Ministry degree programs. Associate of Christian Ministry – This program requires completion of 60 Academic Credit hours – 30 of which may come from successful completion of the Diploma of Ministry program. Bachelor of Christian Ministry – This program requires completion of 120 Academic Credit hours, 30 of which may be granted, at CBCS discretion, from Church/Life experience subject to payment of the applicable academic credit(s). An additional 60 hours may come from the successful completion of the Associate of Christian Ministry program, as described above. Masters Degrees – Masters Degree programs, including the Master of Biblical Studies; Master of Religious Education; Master of Pastoral Counseling; Master of Worship Theology; and Master of Theological Studies, and Masters of Messianic Jewish Studies, are offered according the Chesapeake Bible College and Seminary 2016-2017 Course Catalog. Doctors Degrees – Doctor Degree programs, including the Doctor of Theological Studies; Doctor of Religious Education; Doctor of Worship Theology and Doctor of Clinical Pastoral Counseling, are offered according the Chesapeake Bible College and Seminary 2016-2017 Course Catalog. Many courses are already available online, in first generation PDF version access, at the College’s website at www.CBCSOnline.org. Other courses are available for independent correspondence study by arrangement with the College. Also, the College has agreements with various Distance Learning Centers, which use CBCS approved curriculum to train and test students, and who then submit completed results to the College which then recognizes those studies for Credit in the CBCS degree programs. All student activity is monitored and recorded at the College’s Main Administrative Offices in Ridgely, MD, under the day-to-day direction and supervision of Pastor Ed Connatser, who serves as the College’s Executive Vice President. Chesapeake Bible College enables students, regardless of their life situation or daily schedule, the opportunity to earn a degree in Bible and ministry-related subjects through the combined evaluation of their church service, life experience and previous college credits. Whether through traditional classes or correspondence, students may choose from a range of academic programs from the diploma to the doctor’s level. These educational offerings are delivered through Distance Learning Centers (“DLC’s”) as well as individually through Individual Student Correspondence (“ICS”) Online Courses. Chesapeake Bible College and Seminary is a Christian educational institution which works with local churches to provide classes in Bible subjects, Christian living, and ministry. Over the years, Chesapeake has developed a curriculum that is economical and user-friendly, contains doctrinally sound Christian educational courses, and is adjustable for churches of various sizes. Chesapeake Bible College and Seminary has satisfied all the criteria for the status of an exempt religious-degree-granting institution as set forth in Section 11-202 of the Education Article of the State of Maryland. This enables the College to legally share its ministry with local churches. The College will accept a certificate of completion for courses taken at approved Schools of Ministry. Such courses may then be accepted by the College for credit. 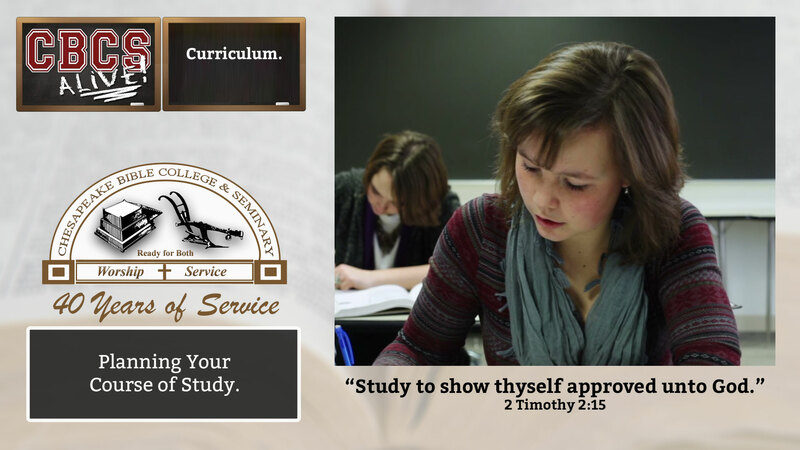 CBCS already has over 60 courses online which give students the opportunity to earn a Diploma, Associates, or Bachelors in Biblical Studies. This online program is unique in that the student has two option concerning their academic schedule. Option 1 – CBCS can lay out their academic schedule for them. Option 2 – The student can lay out their own academic schedule from a select group of courses online to earn their degree. Students taking online courses are not bound to a semester schedule, they work at their own pace. Prospective students interested in taking courses online can view a list of the available courses by visiting www.CBCSOnline.org. Directly at the Web site, students can follow the directions regarding enrollment, availability of courses, etc. The College also acknowledges that certain students and prospective students prefer to study in the traditional method of external studies, in which course materials are mailed to them and continues to offer this method of instruction. Powered by TYG Media, LLC and Designed by Ocean Floor Ministries, Inc.